Below is a list of all of the materials that we use in our workshop and their specifications to help you when choosing a material for your sign. We print directly onto vinyl and then mount the vinyl onto your chosen substrate ie. Foamex, Rigid Plastic, Di-bond etc. If you are unsure about which material to use for your sign, we can advise you on the best material to use, whilst taking into consideration your budget, location, sign requirements and whether you require a long term or temporary sign. If you have any questions regarding sign materials then please contact us. Self adhesive vinyl is a flexible and versatile PVC substrate with a permanent adhesive backing. This material is weatherproof making it suitable for indoor and outdoor use and it can have either a shiny gloss or smooth matt finish. Matt vinyl has a low reflective surface making it more suitable for indoor use as it doesn't glare under indoor lighting. This helps to make any text easier to read. Gloss vinyl is better suited for outdoor use and a gloss finish will help to enhance the colours used in printing which is great for large graphics. Easy to apply - wet or dry method (please contact us for more information). Can be cut to different shapes, complex designs and cut lettering. Self adhesive vinyl is most commonly used to create indoor and outdoor graphics for signage, advertising displays, vehicle graphics, window graphics, stickers and much more. Frosted vinyl is primarily used to add a privacy film to exterior windows or interior glass, for example glass doors. It will give your glass the appearance of etched or sandblasted glass, whilst still allowing light to shine through. Frosted vinyl can be used for exterior windows, glass doors, residential and retail environments, offices, conference/ meeting rooms and any other suitable application. Easy to apply (please contact us for more information). Cost effective alternative to traditional window manifestation such as etching and sandblasting. A rigid PVC material which is sturdy, durable and can be used for interior and exterior use. It is most commonly used for Health and Safety signs and we supply rigid plastic in 1mm thickness. We can also supply 1mm rigid PVC with a self adhesive backing upon request. Our rigid plastic material is white with a smooth satin finish. Foamex is a PVC board which is lightweight, flexible and has a smooth silky matt surface. It is suitable for both interior and exterior use and is ideal to use for displays, advertising, safety signs and all other types of signs, both permanent and temporary. Rigid and durable, our foamex boards are available in either 3mm or 5mm thickness (other thicknesses are available upon request). Correx is a rigid and strong corrugated polypropylene sheeting which is very lightweight and the cheapest form of rigid signage. It is an ideal solution for cost effective signage and is most commonly used for estate agent signs, safety signs, temporary signs and sale boards. Our correx boards are available in 4mm thickness and they have a satin finish. Best used for short term signage (i.e. sale boards). Di-Bond is a lightweight yet rigid aluminium composite material, consisting of two aluminium surface layers enclosing a polyethylene core with a thickness of 3mm. It is a strong, highly durable material making it ideal for exterior use. Di-bond is long term and ideal to use for fascia boards, site boards, post mounted signs and all other types of internal and external signage. We stock banner material from a selection of leading suppliers such as Spandex, Image Perfect and Metamark. All banner materials are high quality and specifically designed for printing on large-format inkjet printers, like the ones we use in our shop. We print all banners using CMYK eco solvent inks for long life. 440gsm white event banner PVC - This is our most popular material and it is best suited for single sided banners, such as our Indoor/ Outdoor Banners and our X-banner stand. 550gsm blockout PVC - This is our strongest material and it provides 100% opacity which makes it perfect for double sided banners, such as our double sided Scaffold Banners. Suitable for indoor and outdoor use. 170 micron white satin, grey backed polypropylene - We use this material for our Eco Roll-up Banner and it is tough, scruff resistant and has a satin crystal finish. Best suited for indoor use. 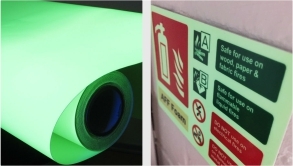 Photoluminescent vinyl is a glow in the dark material which is designed to illuminate in total darkness. It is mainly used for fire exit, emergency escape and fire equipment signs and can be used for interior and exterior use. In daylight photoluminescent vinyl is white in appearance and in darkness it glows a fluorescent yellow/ green. Magnetic signs are a simple, cost effective alternative to applying vinyl graphics directly onto a vehicle. They are very popular with small businesses and for dual purpose vehicles such as taxis, as they allow you to display and remove your advertisement from your vehicle easily. They can also be used for any other suitable application, ideally removable and re-usable signs. Our magnetic material is available in 0.75mm thickness, is magnetised on one side and has a semi-gloss white vinyl on the other which is able to accept vinyl lettering or digitally printed vinyl graphics. Please Note: It is important that vehicle magnetic signs be removed regularly, cleaned, dried and re-positioned.